I can’t believe how long it’s been since I’ve posted. I’ve neglected this blog due to my new blog. Need to make more of an effort to post here more regularly. 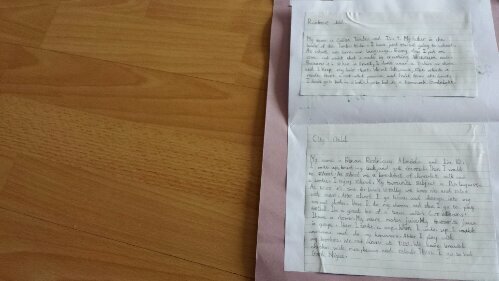 R’s old penpal that she’s had since she was 4 years old has started to write to her again and she has 2 new penpals too. Zuzu has 2 penpals. And Y also has one. They love receiving letters in the post. We’re all kinda addicted to Postcrossing! !! We’ve received 3 postcards from China, USA and Ireland. And our postcards have reached various countries in Europe. I’m going to blog about how we’re turning this hobby into something educational soon inshaAllah. The boys are mashaAllah progressing nicely in their hifdh and are both working on their fatha, dammah and kasra at the moment. Their reading is mashaAllah coming along. Maths is the highlight mashaAllah and I’m just over the moon I switched over to Singapore Math. Esp for Zuzu who just loves math now. He used to struggle before! R is carrying on as usual with her hifdh mashaAllah. Quran is taking up more and more of time but inshaAllah she’ll get there. Arabic – she’s reading the stories of the prophets in Arabic and translating it to me so I can check her understanding. English is a mixture of stuff for her. I’m trying different methods to develop her writing. .. Need to blog more about that. Math is ticking along for her alhamdulillah. Just 1 or 2 exercises daily. She still reads a lot but not as much as she’d like as Quran takes up most of her time. She loves baking and probably why I’m not shedding any weight! Mmm… boys swimming coming along nicely mashaAllah. Zuzu is like a fish in the water mashaAllah but doesn’t really like sports. Y still loves drawing and writing. Oh and Y turned 4 a few days ago mashaAllah. 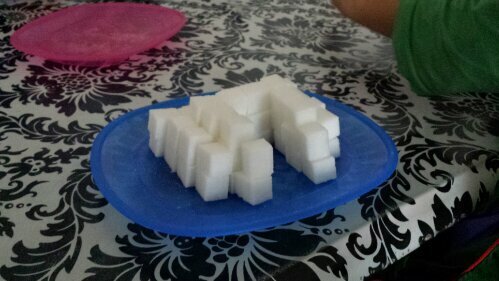 .. brought back sweet memories of my lovely water vba2c mashaAllah. How time flies! Baby S is 15 months mashaAllah and loves singing the arabic alphabet and is addicted to one arabic alphabet nasheed on YouTube. We’ve all memorised it! ! That’s about it. Nothing exciting I’m afraid. Just ticking along with everyday home Ed. Sometimes it’s nice like that – regular and consistent alhamdulillah. Post office and Postcrossing! ! Whilst I’m a firm believer in planning home Ed, I’ve learnt over the years that it’s crucial to be spontaneous and follow the child’s lead. I was going to go and post a few items and Zuzu was jumping up and down to go to the post office to post his card to his penpal. Instead of taking all 4 kids with me, I delayed it to when my husband could be home with the other three. 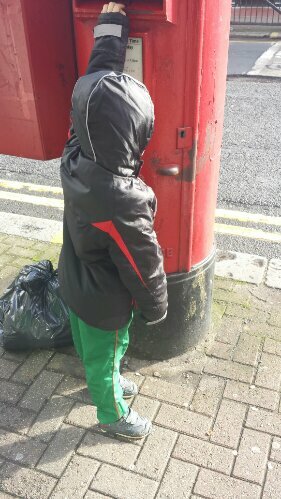 On route, we discussed the need for a stamp, writing the address and his own on the back and what happens to the letter once we’ve paid for postage. Simple conversation really but what was nice was it was just the two of us and rather than me tell him about the process, he witnessed it. Our local post office is run by a Muslim aunty and uncle and they answered his questions and let him observe everything they were doing. I truly believe Home edders need to try and grab these moments of interest and act on them. So when we came home, we finally signed up to http://www.postcrossing.com and the system initiated three addresses: one to Russia, one to Germany and one to the Netherlands! All recipients were adults. Zuzu and R both wrote their messages. And I wrote the last one with a message about Islam. What is great is the recipients will never have your address to reply to! So I’m seeing this as a good dawah opportunity inshaAllah. I highly recommend Postcrossing but make sure you understand how it works and don’t let your kids do it on your own as it involves adults too! Oh and on the advice of another sister who has been doing it, when your post comes through don’t let kids who can read pick up the post! We’re planning to make this educational by marking in green on a map of the world where we’ve sent postcards to. And then in blue arrows all the countries that have sent us postcards. For each country we’ll learn something about that country. Zuzu walked up to me today and decided that he would like a penpal from Russia! Mmm… That might be tricky and I tried to explain that to him but in true Zuzu style, he won’t have it any other way. So please are there any sisters out there in Russia reading this blog? Zuzu is almost 6 and keeps asking me every 5 minutes if I’ve found him a penpal! R is also looking for a penpal. She had one a few years ago from Canada but became a bit disheartened when she didn’t receive a reply to her last letter. Any sisters out there with a daughter in a different country between the ages of 9 and 11? Please let me know. Jzk! 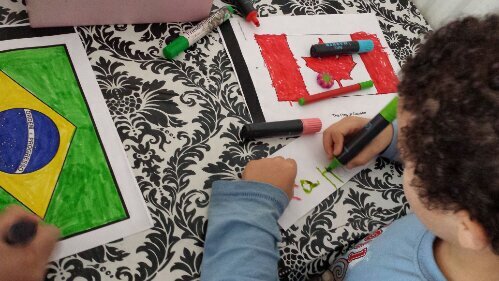 For the month of November, the children chose to learn about a country of their choice. This is a bit of a long post but wanted to put everything in one post. R chose Brazil. Z chose Canada. 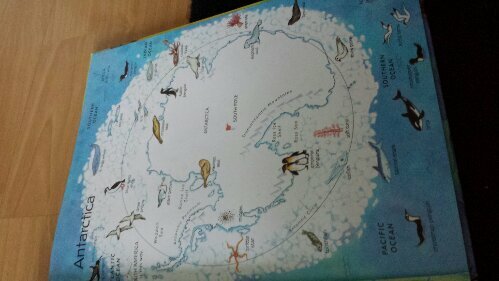 Y chose Antarctica. They all began by doing some flag work. 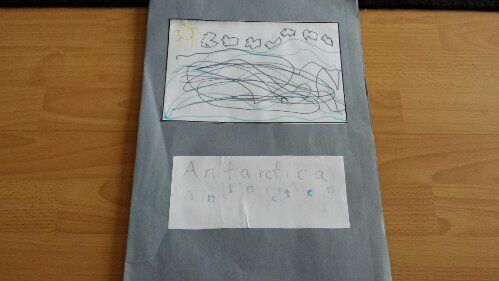 Antarctica doesn’t have a flag so Y designed his own with lots of snow everywhere! 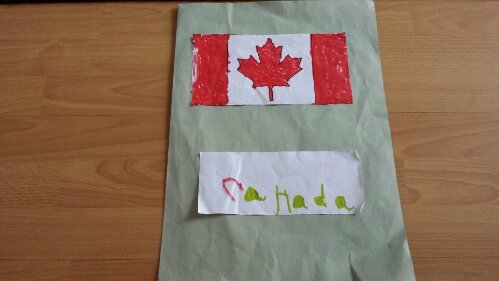 For R’s project, I let her decide how she wanted to learn about her chosen country. 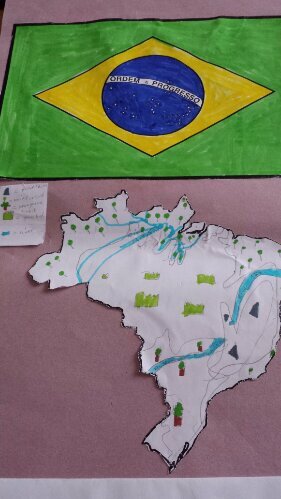 R mapped Brazil and used a key to identify mountains, rainforest etc. She was reading about the northern hemisphere and southern hemisphere of the world and that the southern hemisphere have their summer whilst the northern have their winter. 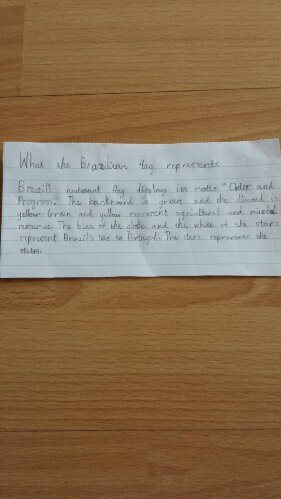 She’s not sure but she thinks Brazil may have two different seasons in one country as the equator runs through Brazil? Anyone know if this is true? 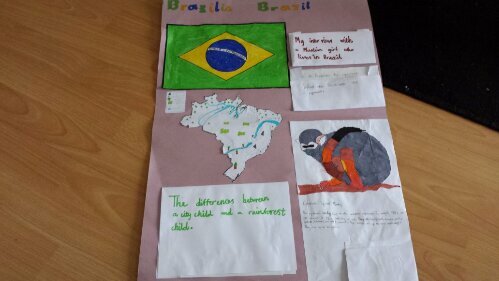 She then researched what the Brazilian flag represents. .
She then decided to research and compare the life of a city child and rainforest child in Brazil and wrote about it. .
She chose the Squirrel monkey to research. . The girl sent R some photos and one that amazed R were some Capybaras crossing the street as though they were tiny mice or rats that cross the street at night in the UK. Capybaras are huge rodents. . can you imagine catching one in your kitchen!! 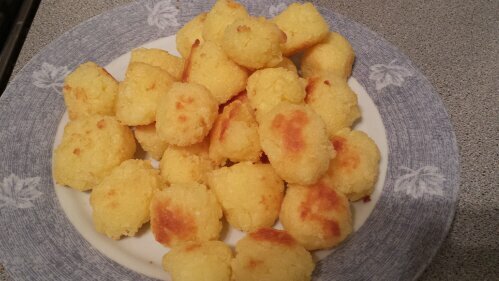 R made some traditional food and made Pao de Queijo which are Brazilian cheese breads. They bring back memories of my above friend making them for me when I was pregnant with R as I was addicted to them.How time flies. .now R is making them for me. We used cornflour as we couldn’t find tapioca flour. 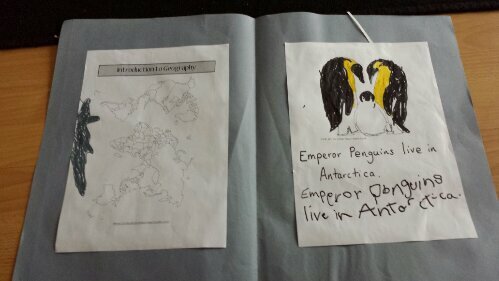 R decided to create a poster to put it all together. Onto the boys. I kept it very simple with the boys. 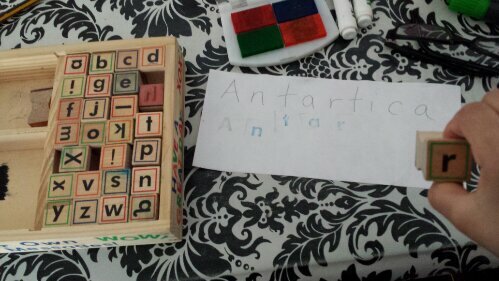 ..
Z wrote Canada and Y stamped Antarctica with the alphabet stamps. 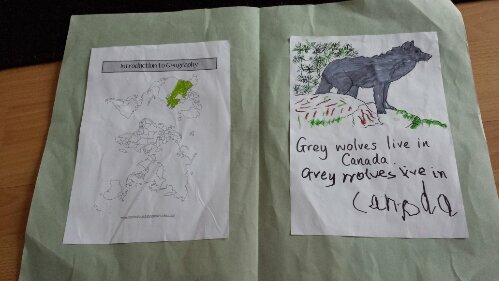 They then coloured their country on a world map. 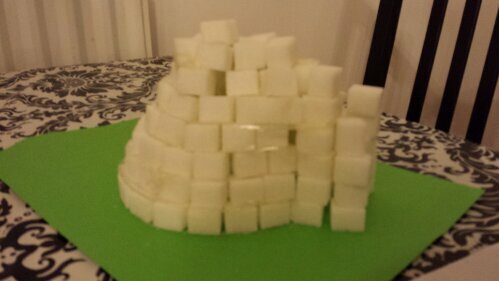 The boys made igloos using sugar cubes. 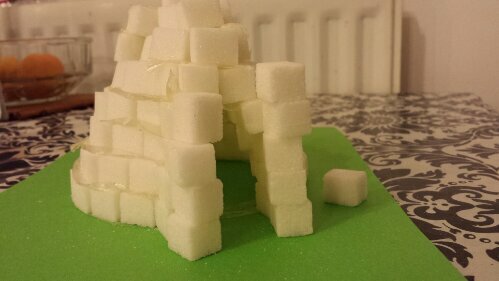 We watched some videos about igloos and Eskimos on YouTube. We then looked at a great Usborne book we have which is perfect for younger children and they chose an animal from their country. 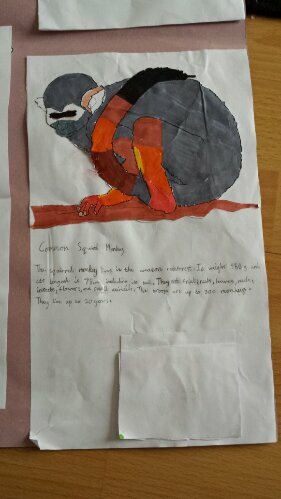 They coloured the animal and did some light copy work. We looked at pictures online and watched more videos and read some books about the animals in their country. 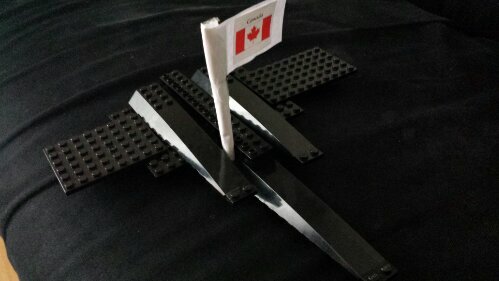 Z decided to make a Canadian aeroplane.. I was telling a sister that unlike his brother and sister, he really doesn’t like to do math, phonics etc. But he loves this kind of stuff. We also discussed the time difference and different sports that are played such as ice hockey. Z also spoke to his uncle who has been living in Canada for the last few years. Both boys were very proud when we put their little books together. .
And that’s the end of another project for November alhamdulillah. I wanted to do more for both our wind project and country project but as we were going to Forest school every week there wasn’t enough time. But it goes to show you don’t need to cover everything when learning about a topic. Today I’m planning our next project inshaAllah. . Science experiments for science and climate and weather also for science/nature. Very quick post. Don’t underestimate the importance of visuals or posters. Near our kitchen table we have a poster map of the world. At meal times it akways leads to discussions about the world, flags, countries etc. Today at breakfast R noticed that the continents look like jigsaw pieces and recalled a book she read about continental drift. I thought opportunity to learn. .. so we went to YouTube and found this video which is really great for kids. A bit of autonomous learning at breakfast time on a Saturday morning. .
We need to grab these opportunities of sudden interest. Posters really are great in initiating discussion. I’m thinking of changing our posters regularly. It’s a good place for us as when the kids don’t like something I cook, they take ages to eat the dish and stare at the poster I put up which gets a discussion going. We have just returned from our first ever family camping trip masha’Allah! We spent a week living in a tent, cooking on a camping stove surrounded by the forest in the beautiful Dorset countryside. Masha’Allah, the trip was arranged by a friend who also home educates and there were two other home edding families who attended as well as some other families with little ones. WE ALL ABSOLUTELY LOVED IT! It was stressful at times – toilet times, tantrums from the boys, the chilly coldness at night but we are definitely going to do it again insha’Allah.The kids were in their element and so were the parents! As there were no lights anywhere, the night sky was simply breathtaking – and we could see what looked like galaxies, the saucepan constellation and stars like I’ve never seen them before. I must say, living in camping conditions was definitely an experience I’ll never forget. It really was great to be away from technology. Spending time with the family surrounded by nothing but greenery was fab. It also showed me areas I need to work on – shouting being the main one!